Portuguese fire code is prescriptive but performance based approach is allowed in unusual or heritage buildings. Fire Safety Engineering is slowly being accepted in Portugal and there is a lot to be done concerning technical knowledge and proper regulatory framework. This conference intends to take a step forward promoting the PBD approach. The conference will be bilingual (Portuguese and English) without simultaneous translation. 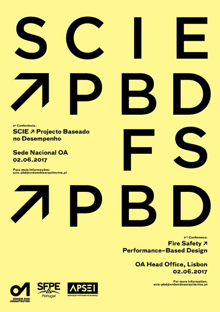 The conference is hosted by Ordem dos Arquitectos (Portuguese regulatory body for Architects) and co-organized by SFPE Portugal. The conference will be held in Ordem dos Arquitectos headquarters in Lisbon. Conference fee is 75€. Registration is made online here.